Microsoft Word gives us many great options such as macro for easy and better use. Simply macros are the commands for different actions, or we can say that macros are the recorded actions. In this post we are going to learn how to record a macro and use it with an easy way like a SHORTCUT! A macro that moves a word left to right. Place your mouse courser at the right side of a word. Go to VIEW Tab & Macros group. 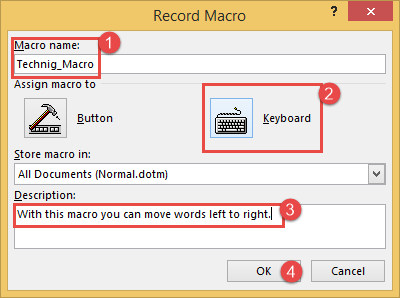 Select Macros drop-down button and Record Macro. If you want, add some Descriptions. Click Assign to specify that shortcut for your macro. See your Keyboard Shortcut here. Now your macro is being recorded. You must have place your courser to the any word in the middle of the sentence. Press F8 two times to select that word then press Esc. Hold and Press SHIFT + Delete buttons on your keyboard to send the word to Clipboard. Hold and Press Ctrl + Right Arrow Key, to Move your mouse courser to the right of the other word. 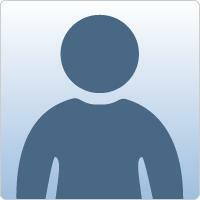 Hold and Press SHIFT + Insert buttons on keyboard to paste the word from Clipboard. Hold and Press Ctrl + Left Arrow Key, to bring the mouse courser to it’s first place. Now you can stop Macro from Status Bar. Your Text should look like this! Congrats! 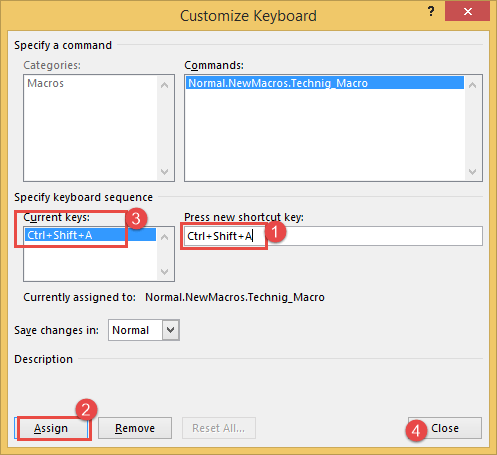 Now it is completed and you can move a word from left to right by the Keyboard Shortcut or the Macro recorded.